Released June 11, 1917, Her Fractured Voice is a one-reel Black Diamond Comedy filmed and produced by the United States Motion Picture Corporation (USMPC) in Wilkes-Barre, Pennsylvania. The film was distributed by Paramount Pictures. 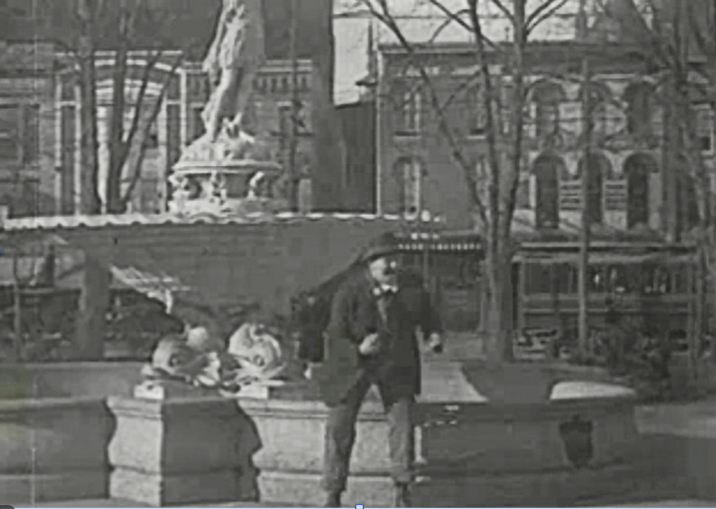 The film stars actress Leatrice Joy as Sue, the “dimpled darling of the dairy,” and offers viewers several scenes of old Wilkes-Barre, including shots of Public Square with trollies and the town’s original marble fountain featuring a sculpture of Kankakee, the mythic Indian princess. The film was screened at King’s College in Wilkes-Barre on October 26, 2012 with live musical accompaniment as part of a community outreach program planned by students in the English department’s professional writing program. More than 75 community members attended the screening. Everyone in this world thinks that she can[’t] sing, but Sue knows she can, and as applause is the stimulant by which great singers are made, Sue looks about her for the incentive. There being a scarcity of listening material, Sue seeks out her old friends of the farm, the chickens and the cows, who, rather than hurt her feelings, in turn politely turn away. Unlike her voice, Sue is quite attractive; and one day there comes to her home to seek board a gentleman of the city. He falls in love with Sue and asks her to go with him, but Sue will not give up her operatic career. Knowing her weakness he promises to make a star of her, and wins her consent to flitter with him at the expense of a broken-hearted country lover. Sue’s dad discovers her flight and acquaints the country lover, who desists in a hanging operation to go to his sweetheart’s rescue. Arriving in the city he knows not which way to turn until he hears that unmistakable noise which he loves so well. Following it for several blocks he arrives at a cabaret just in time to prevent the proprietor from throttling that fog-horn which has started a riot. Throwing the piano at the retreating diners, he makes himself comfortable with a glass of champagne and becomes the best “audience” that Sue ever, or will ever, have.